You must be a member of the Dubai Outdoors & Expeditions Group to attend this activity. Would you like to join this group? This is one of those trips where destination is not important, the journey is. The beautiful mountain/wadi route is fascinating as it unfolds. There is plenty of scope for hiking and trekking in the mountains which are mostly unexplored. 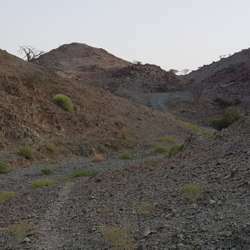 The terrain is a mix of paved and unpaved road & rocky terrain difficult in some areas. 4X4 with high ground clearance and 'All Terrain Tyres'. - Drive on the off-road track and do some easy trekking on the way and reach the exit point by 5 pm. - Decide the spot and setup the camp by sunset. - Enjoy BBQ and chitchat around the campfire. - Return back to Dubai/Sharjah in the night. 1 - BBQ Grill, Tools, charcoal, lighter fluid etc. Please do not depend on others and bring your own stuff to avoid the waiting time. 5- Trash Bags to carry your garbage back with you. 6- Folding chairs / Rugs etc. 9- Proper trekking shoes and comfortable cloths. 10- Sunglasses and hats etc. (a) Acceptance of your RSVP is only notional, and the Organizers reserve the right to select the final list of attendees. (b) You are above 18 years of age, and in case you are bringing family or guests below 18, they shall be accompanied by you at all times and remain your sole responsibility. (c) You have joined us voluntarily and you have the required skills, licenses and permits to be on this trip. (d) The organizers do not hold any responsibility for loss or damage of property (vehicle, gear etc.). (e) You are responsible for your own safety and any act of negligence by You that endangers the safety of fellow passenger(s) or others. (f) You give explicit consent to the organizers that any photos or videos of you and/or your family/ guests/ pet/ car/ gear taken on this trip (or an earlier trip), whether by the organizers or an attendee may be freely shared, used or published by the organizers in any form – print or digital – and/or posted on the group’s social media pages (Internations, Facebook/ Whatsapp/ Twitter/ Instagram/ Youtube and the like) for the purposes of illustration, promotion, branding, advertising or marketing or record and You explicitly waive any rights whatsoever to challenge or bring an action against the organizers/ hosts for use of such media for the stated purposes.